In his own words “I commenced this squally life on January 28, 1842 in Willistown Township, Chester County, Pennsylvania,” the sixth of eight children of Henry and Hannah (Richards) Colehower. He had six brothers and one sister. His paternal grandparents, John and Catherine Kohlhauer came to America in 1804, arriving at Philadelphia, PA. His maternal ancestors came to America around the time of William Penn’s settlement of Pennsylvania, and were mostly Quakers. James grew up on the family farm until April 1854, when his parents moved to Mount Carroll, Carroll County, Illinois. His father died the next year, when James was thirteen years old. He attended the Mount Carroll Seminary School when not working on the family farm. His mother always wanted him to be a minister, although this institution was serving as the public school initially. In 1860, James moved back to Philadelphia, PA to help at his brother Isaac’s store. He was paid $10 a month with hours from 5 A.M. to 11 P.M. He soon tired of that and may have worked at the Confectionery & Ice Cream Saloon at 3912 Market Street in West Philadelphia, PA, which was owned by Mary (Colehower) Free, a first cousin, and her husband. After the Civil War broke out James returned to Mount Carroll and enlisted for Civil War duty on August 9, 1862 in Company I, 92nd Illinois Volunteer Infantry. He volunteered for a three-year term of service, or the length of the war, as did his brother, David Colehour. His physical description in his file stated that he was five feet six inches tall, fair complexion, blue eyes, and brown hair and was 20 years old. James and David were mustered in on September 4, 1862 at Rockford, IL. James received a “bounty” of $25 and a “premium” of $2 at Muster-in roll. He was promoted from Private to 1st Corporal on October 10, 1862. Both James and his brother David soon came down with typhoid fever, with David dying at Nashville, TN on March 17, 1863. Their brother, Hiram Colehour, came down for the body, not knowing if James was going to survive. Unfortunately, it was Hiram that caught the fever and died on May 6, 1863. To add to their mother’s misery, brother Isaac Colehour died on December 4, 1863, making three brothers dying in a span of nine months. 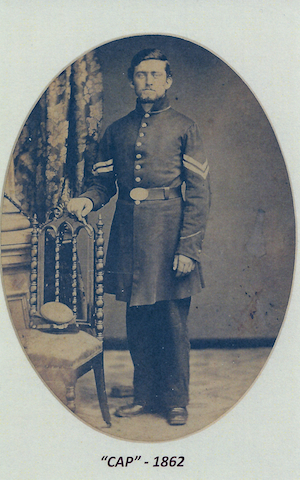 In late 1863 he was transferred to the Mounted Infantry. James served in many battles during the war. He was shot in the right shoulder in the Battle of Chickamauga on September 19, 1863. He rejoined his company in January 1864 and on January 25, 1864 was shot in the left shoulder at Muscle Shoals, AL. He was given 40 days sick leave and then rejoined his company. He and his company then fought with General Sherman on his infamous “March to the Sea.” His soldiering ended on June 21, 1865 at Concord, NC and he was discharged from service on July 8, 1865 in Chicago, IL. James dictated the story of his war experiences to his son James in a manuscript labeled “Outline of our Daddy’s Wanderings during the early sixties or Three Years with Old Glory amid hardships, joys and privations.” During the war James had written many letters back to family members and many of them are still extant and in possession of descendants. James stayed in Chicago after the war and worked in the Chicago Post Office from 1865 to 1882. He lived in Lake View Township, where he was noted as being Town Clerk from March 1870 to March 1871. On May 1, 1872 he was married to Catherine August (Kate) Catlin, the daughter of Seth and Helen (Griswold) Catlin, in a double wedding with Catherine’s sister, Helen, who married George Phelan. Soon after his marriage he bought a lot in Lake View Township for $1500 and built a home. At this house were born their first two sons, Robert Allison on September 7, 1875 and James Alexander on December 21, 1879. While living here James became captain of a large rifle club and retained the nickname of “Cap” the remainder of his life. Other residents in Lake View were his mother, sister, Sue Jacobson, and brothers Charles and William. Cap’s health became a concern in the early 1880s and was advised by his doctor to relocate somewhere with better atmosphere. An Army buddy had already moved to Battle Lake, MN and persuaded Cap to move there. 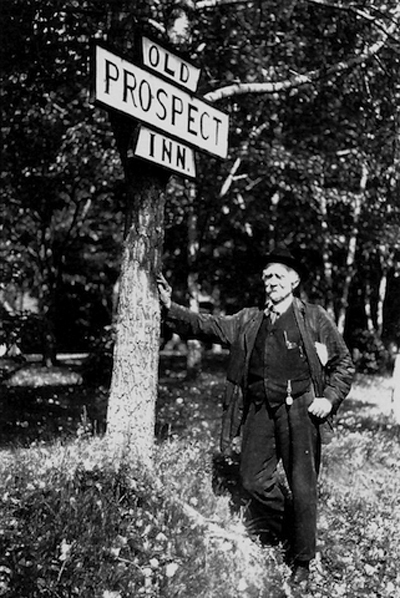 He sold his Chicago house for $2700 and in March 1882 he traveled by train to Battle Lake via St. Paul and Fergus Falls. The rest of his family came on April 15, 1882. On April 29, 1882 Cap bought lots 12 and 13 in Battle Lake for $50. Later that year he purchased part of lot nine from Sarah Sherman. He partnered with E. A. Everts in the lumber business in Battle Lake and worked there until 1886. On December 24, 1884 a daughter was born, Kathrina Helen. In 1885 he built the “Chicago House” with the same blue prints he used on his first house. Cap’s sister, her family and their mother Hannah also moved to Battle Lake in the 1880s, with the sister later moving to Detroit Lakes, MN. In 1887 Cap added on to his house with the intent to open as a hotel for summer guests. When finished this was called the “Prospect House” and was operated as a hotel until 1929. As business increased Cap bought lots 10 and 11 in 1896 and built a small house he called “San Juan” which the couple moved into so they could rent more rooms in the main house. The couple’s last child, Charles Wilson, was born on October 26, 1896. The couple operated the Prospect House until 1925. Cap was 83 years old when he retired. They sold it to their son-in-law, Ernest Wilkins in 1929 for $6000. Cap had many interests over the years and served his community well. He served four terms as Mayor, was Justice of the Peace, was on the school board and was president of the light company. He was a member of the First Baptist Church. He was a member of the GAR Stanton Post #33 of Fergus Falls as well as the Everts Post of the GAR. Cap had the first telephone and the first electric lights in the village. He took an active interest in historical events and gathering historical data and had opened several Indian mounds for the Smithsonian Institute. He was a member of the Otter Tail County Historical Society. He was president of the Agassiz Society of Historic and Scientific Research. He enjoyed hunting and fishing. Cap took to calling himself “Old Grizzly” and his home was “Old Grizzly’s Den.” Cap took ill with the flu in mid December 1938, suffered a stroke on December 18 and died on Christmas Day 1938 due to a cerebral hemorrhage. He achieved the age of 96 years 10 months 27 days. His wife, two sons, daughter, 12 grandchildren, three great-grandchildren and his sister survived him. His wife joined him on July 28, 1940, at age 89. They are buried side by side in Lakeview Cemetery in Battle Lake.